It is amazing how many spouses do not know how to read or understand the many intricacies of the Leave and Earning Statement or the pay stub that is more commonly know as the LES. Let’s be honest….the LES is like most things the government invents. It’s confusing as all get out! There are so many blocks and so many different codes that everyone must know in order to make sure that you are getting paid what you deserve. Too many spouses get deployed overseas and the wife (or husband) is left to figure it all out alone. In the beginning of the Iraq war, many of our Soldiers had to leave at a moments notice and did not have access to a computer for quite some time. It was up to the spouses left in the rear to ensure that everyone was receiving the financial entitlements they deserved. So, for everyone’s sake, the service member’s LES is very important piece of paper to understand. So, below is a little breakdown of the different fields of a Leave and Earnings Statement (LES). Fields 1 – 9 contain the identification portion of the LES. Field NAME. The member’s name in last, first, middle initial format. Field 2 SOC. SEC. NO. The member’s Social Security Number. Field 3 GRADE. The member’s current pay grade. Field 4 PAY DATE. The date the member entered active duty for pay purposes in YYMMDD format. This is synonymous with the Pay Entry Base Date (PEBD). Field 5 YRS SVC. In two digits, the actual years of creditable service. Field 6 ETS. The Expiration Term of Service in YYMMDD format. This is synonymous with the Expiration of Active Obligated Service (EAOS). Field 7 BRANCH. The branch of service, i.e., Navy, Army, Air Force. Field 8 ADSN/DSSN. The Disbursing Station Symbol Number used to identify each disbursing/finance office. Field 9 PERIOD COVERED. This is the period covered by the individual LES. Normally it will be for one calendar month. If this is a separation LES, the separation date will appear in this field. 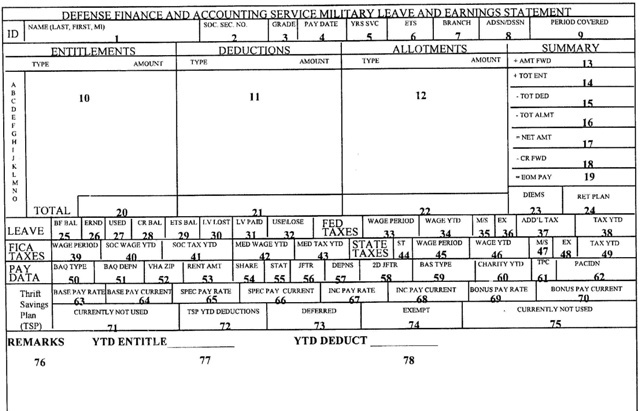 Fields 10 through 24 contain the entitlements, deductions, allotments, their respective totals, a mathematical summary portion, date initially entered military service, and retirement plan. Field 10 ENTITLEMENTS. In columnar style the names of the entitlements and allowances being paid. Space is allocated for fifteen entitlements and/or allowances. If more than fifteen are present the overflow will be printed in the remarks block. Any retroactive entitlements and/or allowances will be added to like entitlements and/or allowances. Field 11 DEDUCTIONS. The description of the deductions are listed in columnar style. This includes items such as taxes, SGLI, Mid-month pay and dependent dental plan. Space is allocated for fifteen deductions. If more than fifteen are present the overflow will be printed in the remarks block. Any retroactive deductions will be added to like deductions. Field 12 ALLOTMENTS. In columnar style the type of the actual allotments being deducted. This includes discretionary and non-discretionary allotments for savings and/or checking accounts, insurance, bonds, etc. Space is allocated for up to fifteen different allotments. If a member has more than one of the same type of allotment, the only differentiation listed may be that of the dollar amount. Field 13+AMT FWD. The amount of all unpaid pay and allowances due from the prior LES. Field 14+ TOT ENT. The figure from Field 20 that is the total of all entitlements and/or allowances listed. Field 15– TOT DED. The figure from Field 21 that is the total of all deductions. Field 16 – TOT ALMT. The figure from Field 22 that is the total of all allotments. Field 17 = NET AMT. The dollar value of all unpaid pay and allowances, plus total entitlements and/or allowances, minus deductions and allotments due on the current LES. Field 18 – CR FWD. The dollar value of all unpaid pay and allowances due to reflect on the next LES as the +AMT FWD. Field 19= EOM PAY. The actual amount of the payment to be paid to the member on End-of-Month payday. Fields 20 – 22 TOTAL. The total amounts for the entitlements and/or allowances, deductions and allotments respectively. Field 23 DIEMS. Date initially entered military service: This date is used SOLELY to indicate which retirement plan a member is under. For those members with a DIEMS date prior to September 8, 1980, they are under the FINAL PAY retirement plan. For those members with a DIEMS date of September 8, 1980 through July 31, 1986, they are under the HIGH-3 retirement plan. For those members with a DIEMS date of August 1, 1986 or later, they were initially under the REDUX retirement plan. This was changed by law in October 2000, when they were placed under the HIGH-3 plan, with the OPTION to return to the REDUX plan. In consideration of making this election, they become entitled to a $30,000 Career Service Bonus. Field 24 RET PLAN. Type of retirement plan, i.e. Final Pay, High 3, REDUX; or CHOICE (CHOICE reflects members who have less than 15 years service and have not elected to go with REDUX or stay with their current retirement plan). Think we are done? Think again! There is a lot more in’s and out’s of the LES that we need to discuss. Be sure to check back later this week when I continue to for more in-depth explinations of the sections of your LES. Next, we will talk about understanding your leave balance. Hello my son just went into the Army last month and forgot to mention he is a lease holder how or who do he contact in order to get help for living expenses.